An ICD is given to patients for many different reasons. Not everyone with a family history of an inherited cardiac condition needs to have an ICD. If your Doctor has decided that you need an ICD then the following information may apply to you. An ICD is a medical device that is implanted just below your collar bone (usually left) to monitor and, if necessary, treat an abnormal heartbeat (arrhythmia). The ICD contains a built in device known as a pacemaker, which can speed up a slow heart rate. The ICD can detect a fast heart rate and the pacemaker can slow down the fast heart rate (without giving a shock), to return the heartbeat to a normal rate. This is known as anti-tachy pacing. The ICD can detect a very fast or potentially dangerous heartbeat and deliver an electrical shock which brings the heart back into normal rhythm. This is known as defibrillation. At your 6 week follow up appointment you will receive information regarding a new national data base called Heart Rhythm Ireland (HRI). You will receive an ID card similar to a credit card approx 2 weeks later. Inform airport security that you are advised not to pass through the scanner. They may ask to see your HRI ID card. Keep an up to date list of any medications you are taking with your ICD Card. Driving guidelines are not the same for all those with an ICD. You will need to inform your insurance company and driving licence authority that you have an ICD in place. If you drive as part of your work you should discuss this with your doctor. For the first week do not raise your left arm above your head, however it is important that you do gentle arm and shoulder exercises to prevent frozen shoulder. Avoid heavy lifting and strenuous sports until discussed with your Doctor after the procedure. Avoid golf for 6 weeks. Your doctor will advise you about other specific sporting activity. Keep a dressing over the wound area for one week after the procedure. Dressings can be changed if needed once the surrounding skin is dried with a clean towel. The stitches in the wound are dissolvable (so they do not need to be removed), but sometimes the ends may need to be removed. If there are still stitches showing after 2 weeks you should see your GP. If you notice that the area around the wound is red, hot or swollen you need to attend your GP and inform the Cardiac Technicians in your hospital where your procedure was done. You may be sore for few days after the procedure, take an over the counter painkiller like paracetamol as directed by your community Pharmacist for 3-4 days. 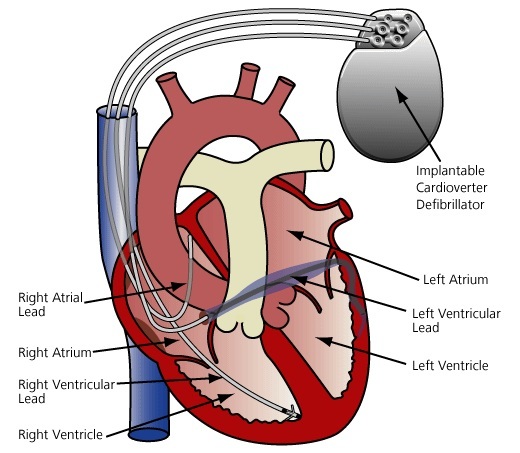 The ICD is implanted in the Cardiac Catheterisation Laboratory and takes about one hour. You will be given local anaesthetic which will numb the area for your device, sedation (medicine to relax you) and painkillers to make you feel more comfortable. Should I take my medications before the procedure? If you take warfarin or warfarin alternative / blood thinners this may need to be stopped before the procedure. Your Cardiologist will need to discuss this with you.All other medicine should be taken as usual, unless otherwise told not to by your Cardiologist. You will be given a medicine through a plastic cannula (drip) in your arm to make you feel drowsy or sleepy, but you will not need a general anaesthetic for the procedure. The ICD is implanted in the Cardiac Catheterisation Laboratory and takes about one hour. You will be given local anaesthetic, sedation (medication to relax you) and painkillers to make you feel more comfortable. The ICD system has 1, 2 or 3 wires (also called ‘leads’) and a battery box with in-built computer. The number of wires used depends on the type of ICD your doctor has decided you need. The wires are passed down to the heart through a vein under the collar-bone. The generator is usually placed under the skin beneath the left collarbone, where you will have a small scar. All information including the possible complications and side effects of this procedure will be discussed with you by your Cardiologist beforehand. Have a light breakfast before 6am on the morning of the procedure and do not eat or drink from 6am on unless told otherwise. Each hospital has its own protocol so you need to check with the hospital where you are having it done. If you take warfarin / blood thinners this will need to be stopped before the procedure. Your Cardiologist will need to discuss this with you. All other medications should be taken as usual, unless otherwise told not to. Is it true that you cannot be cremated with an ICD? You can be cremated but the device has to be removed first. Before anyone is accepted for cremation a doctor (Experienced Registrar or Consultant) has to examine the body to make sure there is no device such as pacemaker or ICD in place. Can I have an MRI with an ICD? With most ICDs you are unable to have an MRI done, but with some of the more modern ones you can, so you need to check with the cardiac physiologists who check your device. Can I have other medical tests done with my ICD? If you are having a small surgical or dental procedure you should make the treating doctor aware that you have an ICD. Also contact the cardiac department before your procedure. If you are having a bigger operation that may use a cauterising device, they may suggest temporarily turning off the ICD just for the duration of the operation. This will be discussed between your Surgeon, Anaesthetists and the Cardiology Team. Can I play sport with my ICD? In general yes but it depends on why you are having your ICD inserted. Leisure activity (walking, cycling, swimming for fun etc) is always good and even encouraged to maintain good health. You can also usually engage in more organised sports activity with an ICD. If you have been told that you cannot play sports due to your condition, an ICD will not change that. If you play contact sports such as rugby, hurling, football etc there is a small risk of the device being damaged due to trauma. You may be able to arrange special padding to wear over the device if considered necessary. You should discuss this with the Cardiology team. Can I drive with my ICD? Driving guidelines are not the same for all those with an ICD (there is usually a brief period of perhaps 1 to 4 weeks when you cannot drive, but this depends on the specific reason why you are having the ICD). Your driving advice will be discussed with you by your Cardiologist. If you drive a HGV or equivalent having an ICD may permanently stop you driving these, so you should discuss this with the team well in advance of the procedure. You may resume sexual activity when you feel able. The ICD allows for a rise in heart rate without automatically discharging a shock. If your heart rate rises to a very fast rate the ICD will not usually discharge a shock unless an abnormal heart rhythm is also present. Even if your ICD discharges a shock the other person will not be affected. Yes you can use your mobile phone. Try to avoid carrying it in your breast pocket on the same side as the ICD. Can I travel with my ICD? Yes. Inform airport security that you are advised not to pass through the scanner. They may ask to see your HRI ID card. At your 6 week follow up appointment you will receive information regarding a new national data base called Heart Rhythm Ireland (HRI). You will receive an ID card similar to a credit card around 2 weeks later. Will I still need to take my medications after I get the ICD in? Yes, the ICD will shock you if your heart goes into a life threatening rhythm but it won’t treat your condition so you will stay on the same medications. How is the battery life checked? How long does the battery in my ICD last? The battery life is approximately 8 years but it could be more or less than this depending on how often it is used. If someone touches me when I get a shock from my ICD, will they get a shock? No, if a person touches you when you get a shock from your ICD, they will not be shocked from it. How often will my ICD be checked? Your ICD will be checked every 6 months. If you get a shock from your ICD you need to contact the Cardiology department to arrange to have your device rechecked. Occasionally some devices need checks every 3 months – your pacing clinic or Cardiologist will arrange this and explain to you if necessary. What do I do if I get a shock from my ICD? It will usually feel like a thump in the chest. If you get one shock and feel OK, then this call can be made during ‘office hours’ or the next working day. If the ICD gives you more than one shock or if you feel dizzy, pass out, have chest pain or are unwell then dial 999 and call an ambulance or a family member can also call.